The oblong scarf measures 13 x 60. It has beautiful variegated color from cream to caramel to gold. 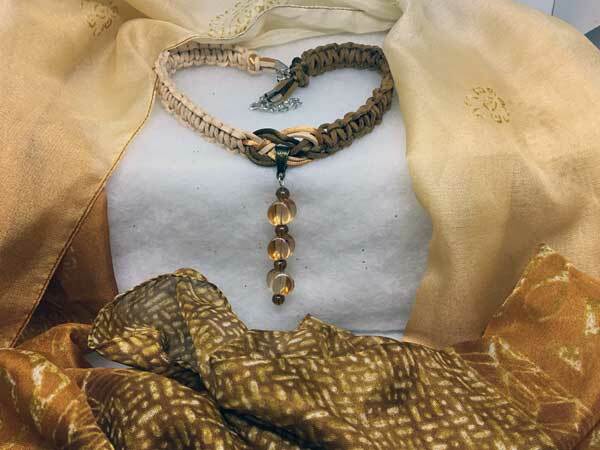 This corded necklace is made using satinique cording in combination of a nylon and spandex cording that looks like suede. The length can vary from about 16 to 19 inches with a center jeweled piece that adds 2.5 inches. It is done in a milk chocolate, ivory, caramel and dark brown. The jeweled piece contains 3 beautiful glass beads that coordinate perfectly with the variegated colors in the scarf. They are separated by dark brown rounds.